Then why do so many organisations struggle with culture and why is it so important, especially when it comes to attracting and retaining the best talent? Our latest insights piece delves deeper into culture and what it means to your team, your company and ultimately the success of your organisation. Heather Gordon, Senior Associate with Barden, and expert in qualified accounting careers, gathered our insights from some of the top leaders across Ireland’s leading practice firms, so this is direct from the horse’s mouth (as they say!). Download our Culture Insights infographic at Culture Insights – A Barden Production. For many, it’s a struggle even trying to define what organisation culture is. To us, it’s the values, behaviours, expectations, experiences, philosophy and the spirit of a company. For it to be successful it has to be shared, believed and lived every day by everyone in your organisation. It’s about how we operate on a day to day basis and ultimately, it’s about our people. So, Why Is Culture So Important? You are the sum of the five people you spend most of your time with. You’ll spend over 90,000 hours in work during your life time (yes, that many!!). That’s more time with work colleagues than with your family and friends. After all, how you feel about the company you work for is how you feel about your job. Funnily enough, it’s rarely about what you actually ‘do’ that matters, it’s ‘who’ you do it for. It’s about culture. People don’t join companies for their brand, a job title, or often even a salary. People join People. And People form Culture. 80% of practice firms think that culture is of “high importance” for potential hires when they are considering joining an organisation. 95% of practice firms rate culture as “highly influential” for their retention strategy. Clear opportunities to grow due to high exposure to senior management from day 1! Top talent will always evaluate the culture of an organisation. Even if you offer the best salary in the world if your culture is bad, they won’t take the role. A powerful and empowering culture is a surer route to success. Without a great culture, most initiatives will fail before they even begin. 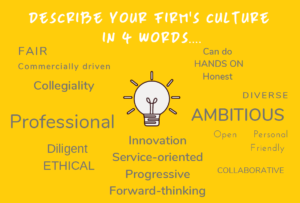 Our final question asked those responding to distinguish their firm’s culture from their competitors. We think the final point sums this all up beautifully!!! Forward thinking & keeping in line with best practices, flexible. Not a corporate feel ” – personal interaction, but with exciting and diverse opportunities. This Culture Insights piece and infographic was brought to you by Heather Gordon. Download it at Culture Insights – A Barden Production. Barden…the recruitment experts that accounting and tax professionals and leaders come to before they start looking for a job or start building their teams. We’re about advice first, jobs second. For the best personalised and objective advice about your professional future, AND for access to the top finance teams in Ireland, get in touch with Heather today.